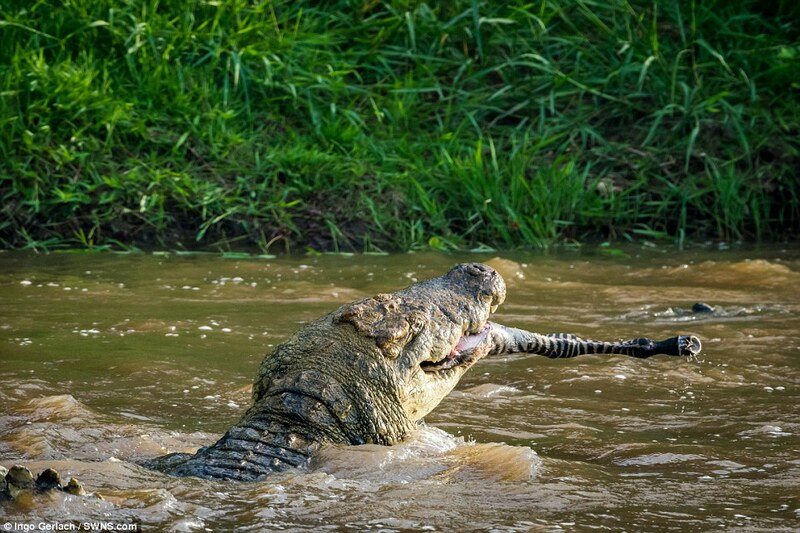 Crocodiles are ferocious predators – and these pictures show exactly why. 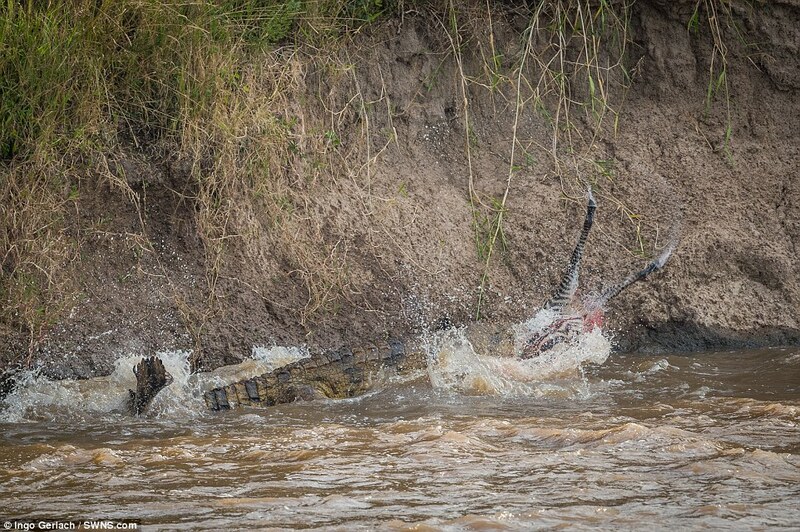 Two photographers captured the moment two African crocodiles demonstrated their incredible hunting skills on two very different types of prey: a pelican and a young zebra. 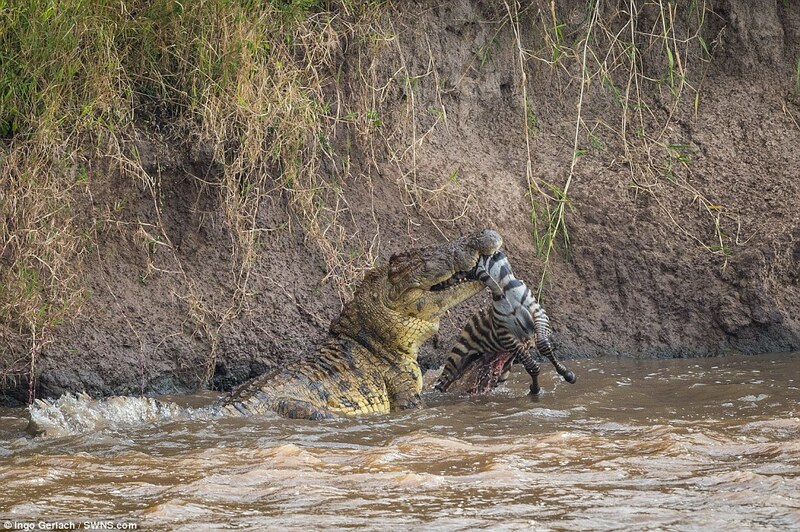 Wildlife photographer Ingo Gerlach was on the banks of the Mara River in Kenya when he saw a huge herd of zebras trying to cross the treacherous waters. 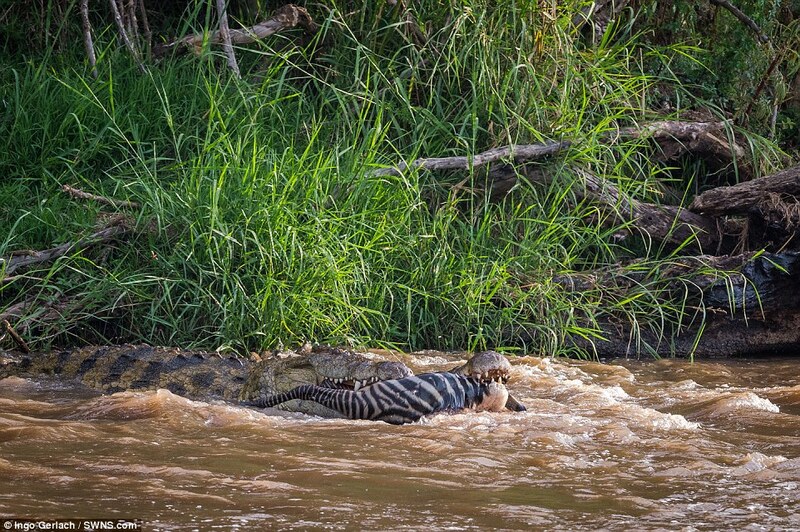 It seemed as if the herd had passed the expanse of water without problems but then he noticed a huge crocodile had pulled a foal under the water. 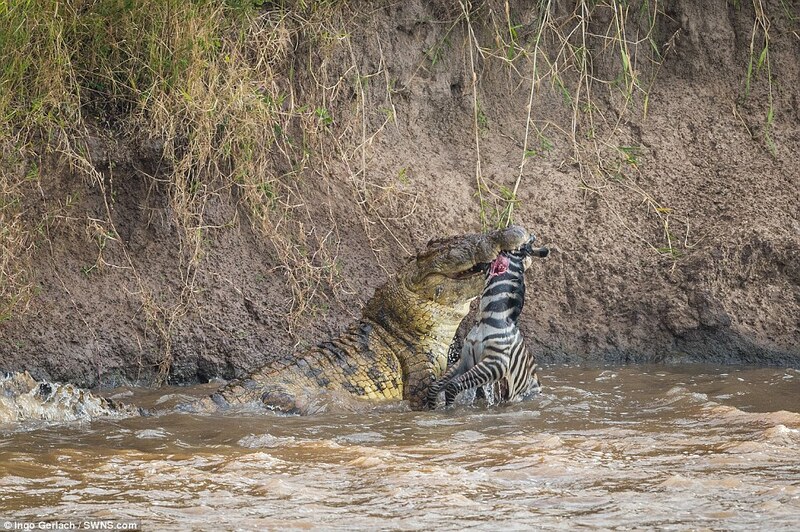 He captured the moment the reptile clamped its jaws down on the zebra and tore it apart. 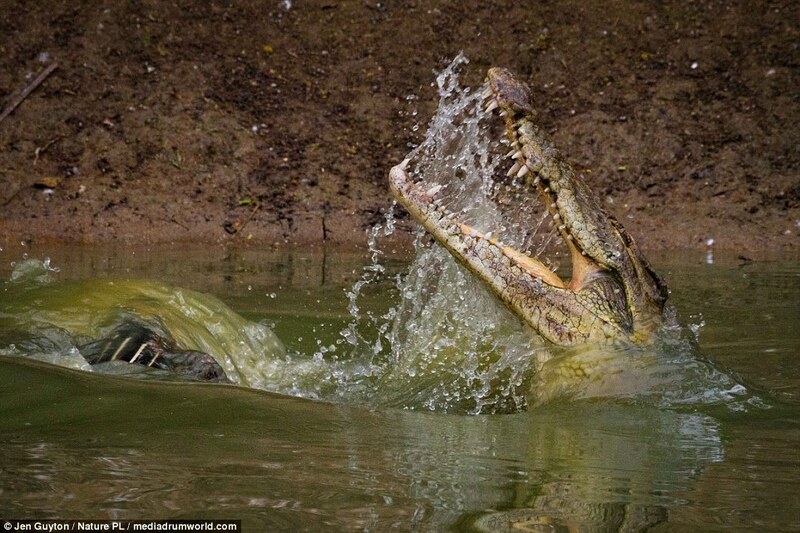 ‘The crocodiles are very brutal. The body of the dead zebra foal is torn apart with extreme force,’ he said. 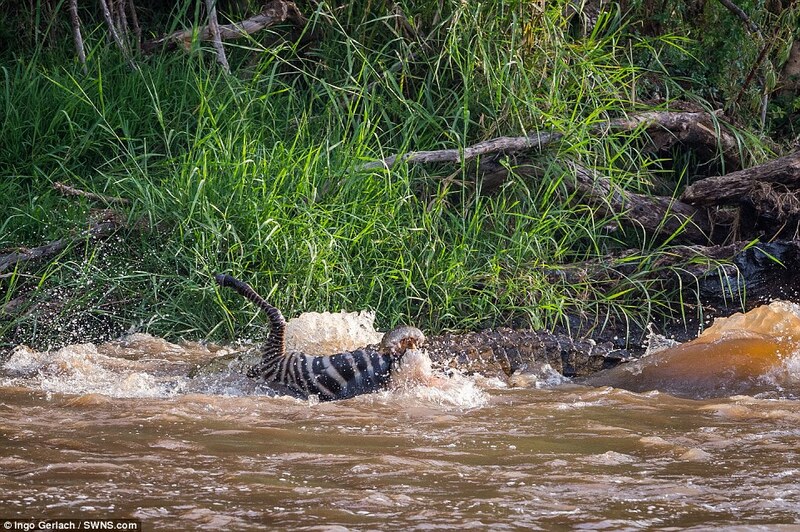 A lone striped leg is seen hanging from the crocodile’s jaw as it continued eating – but nothing was left of the zebra after an hour or so, Mr Gerlach said. 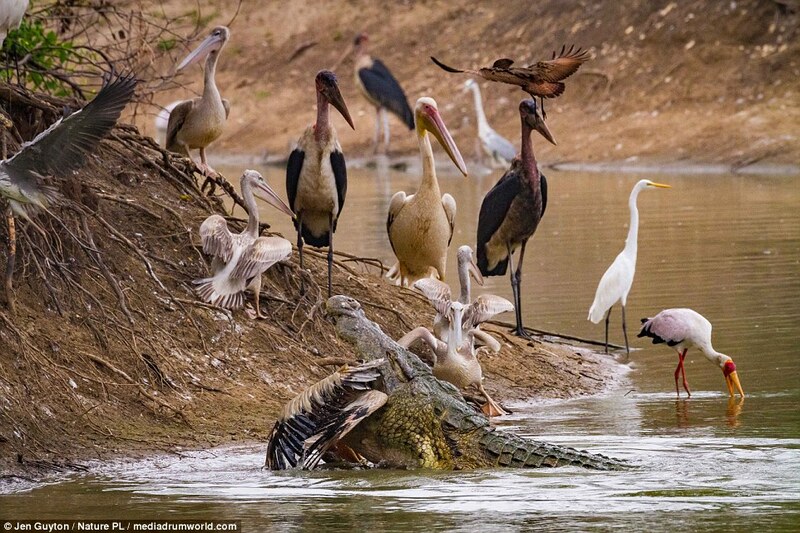 Elsewhere, Jen Guyton captured a crocodile enjoying a pelican supper after sneaking up on a group of unsuspecting birds. 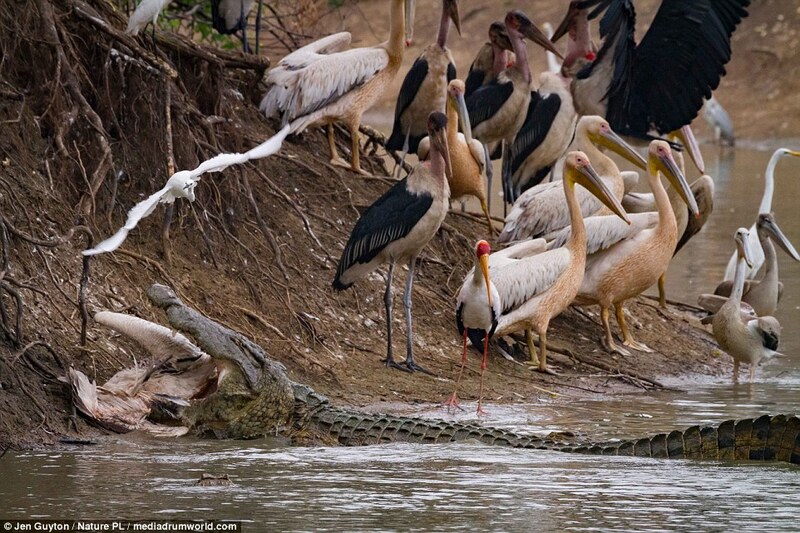 The ecologist and photographer’s pictures show storks and pelicans taking a drink by the Msicadzi River in the Gorongosa National Park in Mozambique while crocodiles are seen lurking just below the water’s surface. 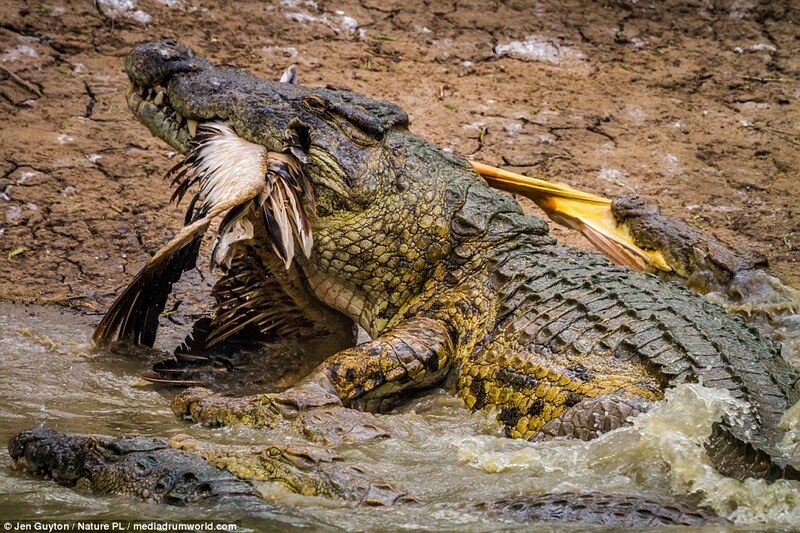 Other striking images show the moment a 400lb jumps into action and snatches a pelican to devour. 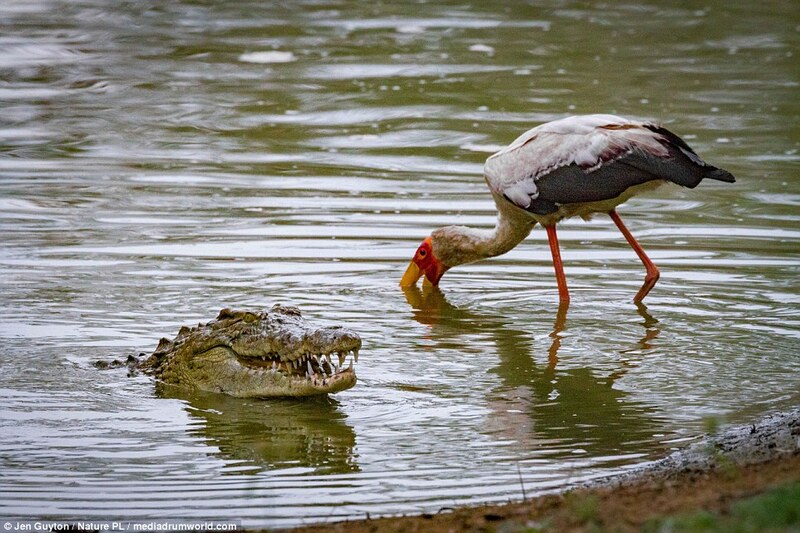 But the large crocodile struggled to swallow his meal and some was eventually stolen by a smaller reptile. 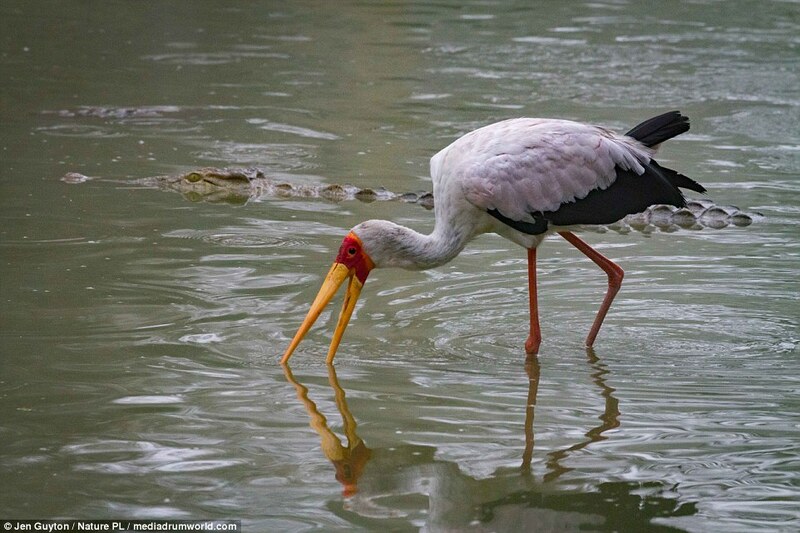 Ms Guyton explained that the dry season led to desperate actions from some species but opportunities for others. 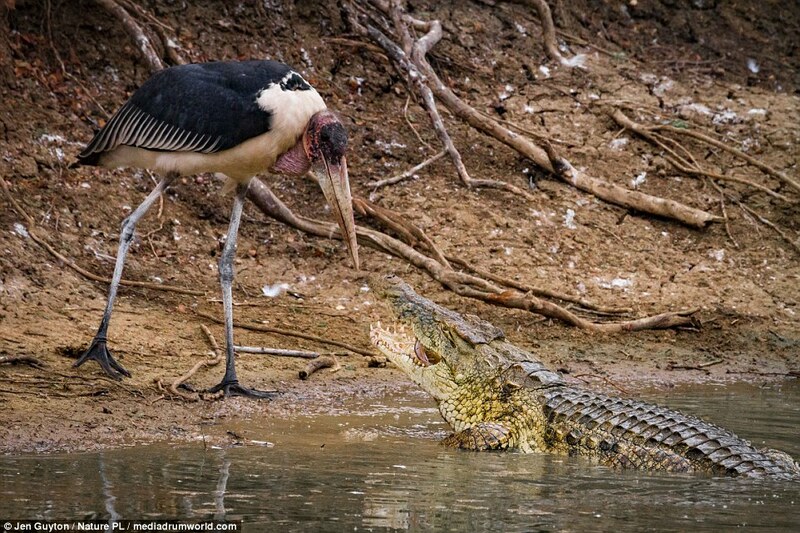 ‘The desperation of some species, like fish confined to ever-shrinking pools, led to opportunities for others: birds and crocodiles gathered together at the lingering Msicadzi River in a tense truce, trawling captive fish from dawn to dusk,’ she said. 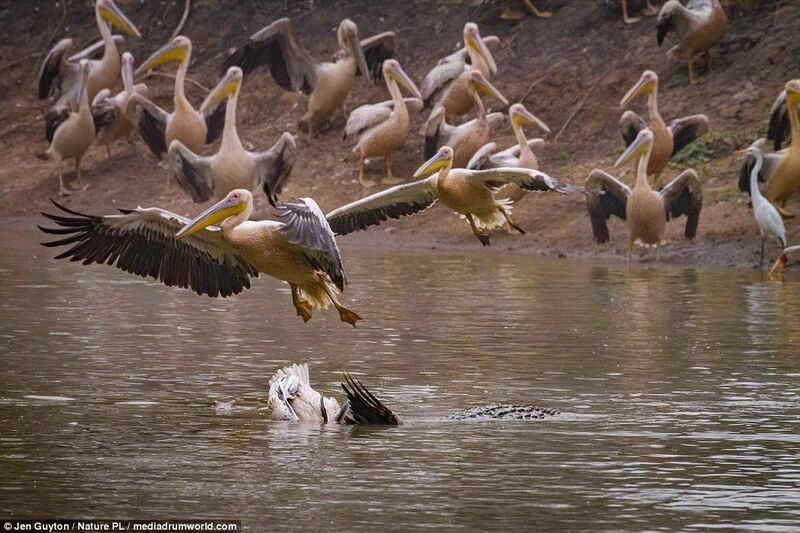 She said suddenly there was a ‘thundering splash’ and numerous pelicans ‘jolted away as it shocked by an electrical current’ – but one remained. ‘It was a few moments before I realised what had happened, when a blackish sawtoothed ridge breached the surface. 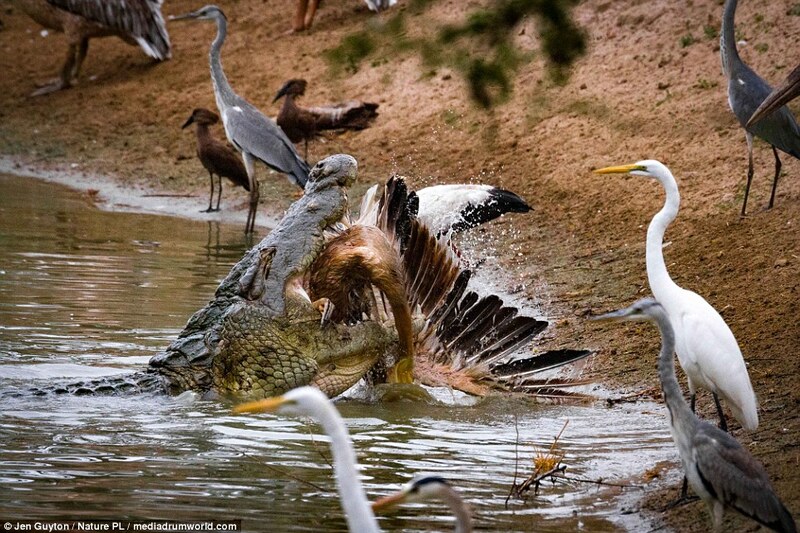 Ms Guyton said the pelican flopped about and refused to go down – and smaller crocodiles in the vicinity quickly realised what was happening. 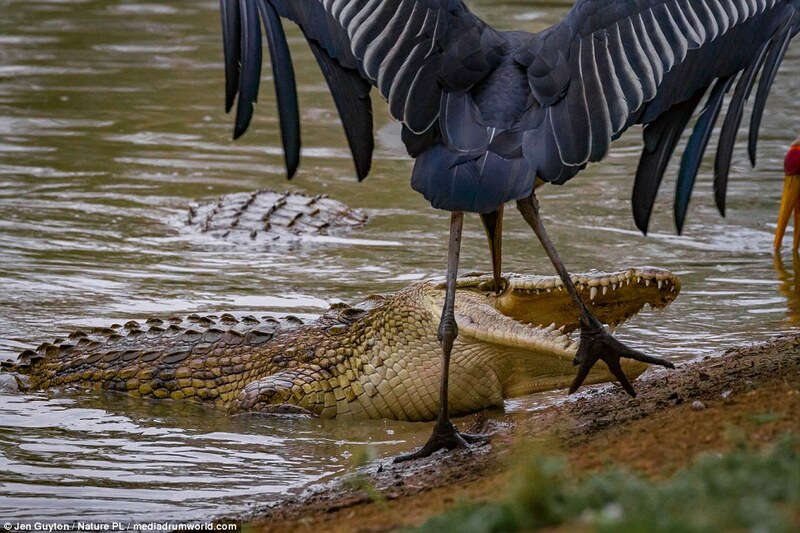 ‘They surrounded him, snapping at his jaws, tossing sharp teeth, seizing mouthfuls of feathers and tossing them back like potato chips. 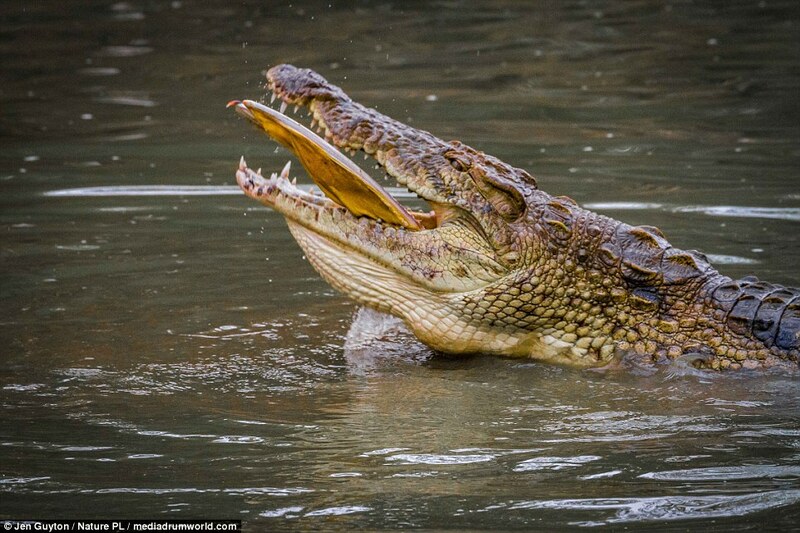 ‘The big croc shoved through them and swam downstream, wings still dangling, five or six smaller crocs in pursuit. 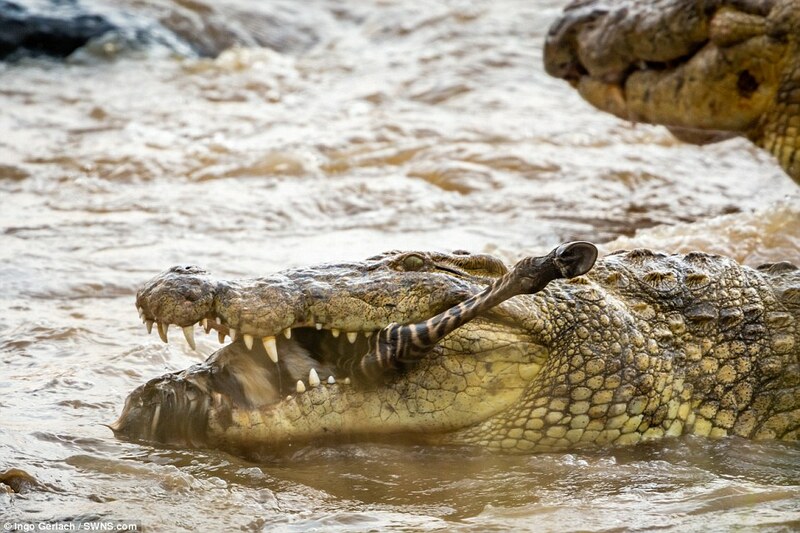 ‘For the next two hours, I watched the croc swim steadily up and down the short stretch of river, pelican wings dragging. Each time he gained distance from the others, he paused, gulping desperately. ‘And each time, a wing got in the way. His pursuers caught up and surrounded him while he seemed to grow evermore desperate.